I can’t explain exactly why Samin Nosrat’s Netflix cooking show, ‘Salt, Fat, Acid, Heat’ is so watchable. I think it’s because her energy is so downright compelling. In the series, Samin, a chef who trained at Alice Water’s Chez Panis restaurant, plunges us into cooking fundamentals, and takes us through the four elements, salt, fat, acid and heat that shape all global cuisines. Here are some highlights from episode 2, ‘Salt’. It focuses on Japan, a specialty of mine as I tend to work with Japanese food companies (oh, and my wife’s from there). The Japanese are big on salt; 4,000 varieties of salt are available there, varying by origin, production method, size of crystals, tastes and colors. We learn that small-grained salts melt immediately in your mouth for a faster salt flavor; larger crystals are less salty as they take longer to dissolve in your mouth. And the Japanese pair stronger flavored salt with foods with stronger tastes, like meat, and more subtle salts with more delicately flavored foods like vegetables. Moshio salt, for example, is a mild sea-salt, made in a traditional way, by harvesting and boiling seaweed. Samin shows us the whole production process, introducing us to the people who make it on an island off southern Japan. The result of their unique, natural process is a coarse, beige-colored salt with a minerally flavor. 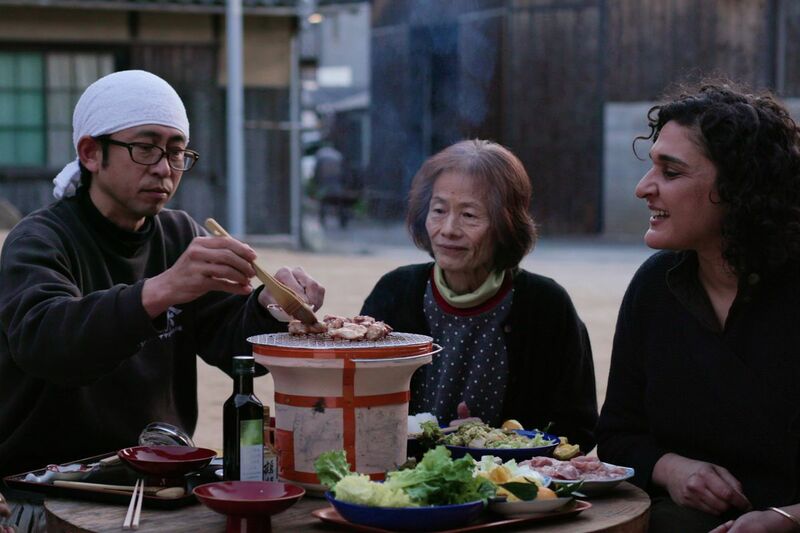 Next, Samin shows us how home-style miso is made. That’s the fermented, umami-flavored paste used to make miso soup and many other Japanese dishes. Miso is made by steaming and then mashing soy beans. Koji, a micro-organism that promotes fermentation, and salt are then added. The mixture is then kneaded to expel any air, to prevent the development of mold, and packed tightly into ceramic jars to ferment for a period of from several months, to two years. It’s how my mother-in-law used to make it. Finally, we’re introduced to Yasuo Yamamoto, a fifth-generation ‘soy sauce whisperer’, who walks us through his traditional production process. Soy beans are boiled and mixed with crushed and boiled wheat, salt and water. The mixture is then fermented in ancient, 100 year-old wooden vats. It is the micro-organisms in the air and in the wood that ferment the mixture, transforming it into soy sauce. Finally, after two years of fermenting, the mixture is pressed and strained to remove solids and the remaining liquid is soy sauce. Yamamoto says, ‘I don’t make the soy sauce, the micro-organisms make it. I just create the environment where they can thrive.’ His soy sauce is unusually complex and rich in umami flavor. Even in Japan, let alone the rest of the world, most people haven’t tasted this type of traditionally-made soy sauce, he tells us. And the point of all this? Samin shows us in fascinating ways, the huge varieties of salt out there, and the importance of knowing when, why and how to use salt in cooking. As well as all the indirect salt-delivery methods – foods like soy sauce, and miso. As well as European foods like cheese, pickles, olives and anchovies. She widens our horizons, showing us glimpses of that big, flavor-bursting world that’s waiting for us out there!